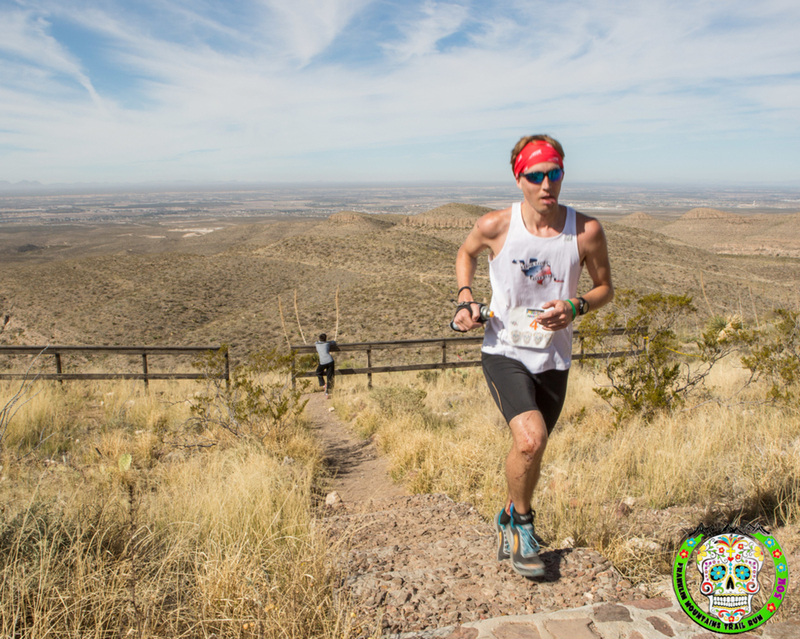 The Franklin Mountains Trail Run in its 1st year attracted over 475 runners from across the lone star state, new mexico and mexico as well. With these amazing runners we also had Gordy Ansleigh in attendance to run the 50k and professional photographer Myke Hermsmeyer as well. The 50k with was a tad over 32 miles boasted 6250' of gain and 6250' down along the technical mountain trails. Out of the gate a pack of early leaders including TEAM TROT runners Josh Pauley, Jeff Ball let out down the trails. Zach Szablewski, Jacob Phillips and Joseph Hale mixed in and the lead pack was heading toward the peak of the mountain. TEAM TROT runner Tracie Akerhielm took the early lead for the females along with Copper Canyon Champion Beatriz Mendez. All of the runners in the 50k made a loop up to the peak and picked up a summit bracelet from TEAM TROT Ambassador Santiago Morales before heading back down the back side of the mountains. Zach Szablewski won the race 4:57 with Jacob Phillips 2nd in 5:02 and TEAM TROT runner Jeff Ball in 3rd at 5:26. Beatriz Mendez took the lead at mile 26 and never looked back. She won the race in 5:53 with TEAM TROT runner Tracie Akerhielm in 2nd at 5:57. Alisha Edmiston was our 3rd female in 6:24. Big thanks goes out to Texas Parks & Wildlife, Franklin Mountains State Park, Visit El Paso and Holiday Inn for helping us get the event up and running. It was wonderful to share the trails with the TROT runners, local El Paso runners and the Juarez Runners as well. Next year the race will be Sept 10-12th and the 50k WILL be part of the US Skyrunning Ultra Series as well. We will open registration March 1st for the 2016 races. We are happy to be included in the 2016 Ultra Series of the US Skyrunning Series. The Franklin Mountains Trail Run will be a 50k mountain race with between 8-10,000' of climbing. We will open registration for the race after the first of the year. Below is a brief description of the history of Skyrunning and how it is formatted. With multiple sets of races in the Skyrunning family, here's a simple guide to them all. Skyrunner® World Series ("SWS") - the foundation of the global Skyrunning movement, with 5 Sky, 5 Ultra and 5 VK events across the world with extremely high levels of competition. Runners score with their best 3 of 5 races from this Series plus 1 more from the new Skyrunning Continental Championships. Skyrunning Continental Championships ("SCC") - new in 2015 to allow runners to have an extra race locally to count for the SWS points. Skyrunner® National Series ("SNS") - started in 2014 in multiple countries around the world to extend the concept of Skyrunning for more people to enjoy. Generally the same 5-5-5 format as the SWS with the best 3 of 5 races scoring for the SNS. Some SNS races are also in the SWS and SCC. In the US, the local SNS is the US Skyrunner® Series. Skyrunning World Championship ("SWC") - occuring every four years, this is the Olympics of the Skyrunning movement. It occurs with multiple disciplines over a single long weekend. The last SWC was at Chamonix in 2014. “Skyrunning” has been around for some time. Hundreds, even thousands of years ago mountains were negotiated out of necessity: war, religious persecution, hunting, smuggling, or just out of plain old curiosity. The concept of running up and down mountains for fun is much newer. Take for example the Ben Nevis Race which goes back to 1903, or the Pikes Peak Marathon which began as a bet in 1954 among smokers and non smokers. The idea of creating a sports discipline however was the brainchild of Italian mountaineer Marino Giacometti, who, with a handful of fellow climbers, pioneered records and races on Mont Blanc and Monte Rosa in the Italian Alps in the early ‘90’s. In 1993, with the support of the multinational Fila as sponsor, skyrunning took off across the world’s mountain ranges with a circuit of awe inspiring races stretching from the Himalayas to the Rockies, from Mount Kenya to the Mexican volcanoes. After all, Giacometti’s term skyrunning, as the name suggests, is where earth and sky meet. Giacometti’s vision didn’t stop there and in 1995 he founded the Federation for Sport at Altitude to address the need for rules to govern the sport and generally manage this fast-growing discipline which today counts some 200 races worldwide with around 30,000 participants from 54 countries. Jackalope Jam's start was 7am for all the 6hr/12hr and 24hr participants at Carbide Park. Team TROT runners Jeff Ball and Tracie Akerhielm shot out of the gates early and within 5 miles were out front and running strong. Jamie Gauthier kept pace as the miles went on with Dan Bucci contesting each lap as well. Mckenzie Morse ran as the 2nd female all day long and looked strong as the miles passed one after the next. Staci Rogge stayed consistent all day long and finished with the 3rd female spot. Brice Fournier lead the 12-hour men's race from start to when he 50 miles. Once he shut it down Orlando Galvan and Brett Cole went lap for lap the last 2 hours. With only 30 minutes left the race was down to the last mile. Orlando and brett both ran the last 30 minutes to finish 1-2 a half lap a part. Orlando nosed on Brett for the 12-hour win and Brice ended up 3rd. Consistent Rachel Adamson had a plan all day and stuck to it to the T. Becky and Martha Hilton both worked extremely hard all day and scooped up the 2-3 spot for the ladies. 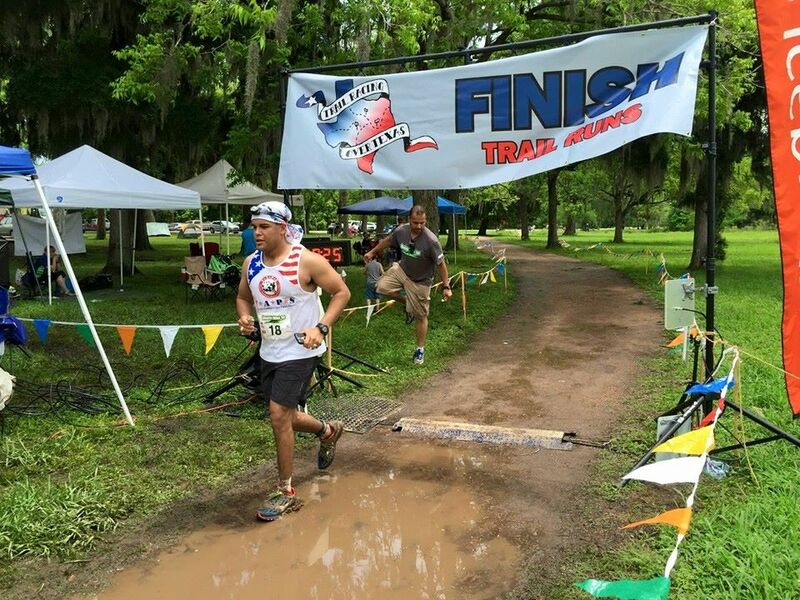 TEAM TROT runner Matt Zmolek took the lead early for the 24-hour race and never looked back. He was closely followed by Marc Gehringer, Shannon Wanning, Kay Scott and dark horse Wayne Schlosser. As the miles went on Wayne and Kay got stronger. In the last 20 miles Wayne moved into 2nd place and Kay took the lead for the ladies. In the end Matt, Wayne and Kay all received their 100 mile buckles in under 24 hours. Marc Gehringer was 3rd male. Shannon Wanning was 2nd female and Michelle Gochis was 2rd female. We are happy to announce that veteran mountain photographer Myke Hemsmeyer will be taking pictures for Trail Racing Over Texas at the Franklin Mountains Race. Myke has recently been following the US Sky Running Series having shot both the Rut and Flagstaff Skyrace as well. We will also be bringing Gordy Ansleigh (original 100 miler/Western States runner) out to the Franklin Mountains Trail Run as well. Gordy Ansleigh has run many ultras/races since that 1974 race and will be a pleasure to have him on the Texas mountains. So come out and see a legend in the ultra running world and get your photo taken by one of the best mountain photographers in the US. As the clock started at 8am the day began for the first Blazing 7s Trail Run at 7il Ranch. The ranch has been working as a cattle ranch for over 150 years all on the beautiful 1100 acre ranch. The ranch has never been officially trail races on so the cows were surprised when all the gun went off. The 100k led out first with the order of running the red, orange and purple trails in that order to complete 1 loop. Each full loop was a bit over 21.5 miles for a total of 63.5 miles or approx a 100k. The 100k was led up front most of the race with Mark Junkans and TEAM TROT runner Matt Zmolek. Melissa Linan led the females out all day long and went to wire to wire. Around the 48 mile mark Matt Zmolek took the lead and finished up in first place for the men. Melissa Linan continued to run hard and ended up 3rd overall/1st female. The 50k was 2 laps of the red and orange loops for the 33 miles. Jeff Miller and Patrick Kubovsky led the race out from the start and hit the 1st loops within minuted of each other. Kimberly Palacios and Kelli Vance stayed within a few minutes of each other towards lap 2. In the end TEAM TROT runner Jeff Miller took the win with a 3:55, followed by Patrick Kubovksy in 2nd with 4:07 and Paul Stewart with a 4:26. Kimberly Palacios finished strong to edge Kelli Vance with a 5:37 to a 5:44 for 1st/2nd. Carmen Martinez hit the wire with a great 2nd loop at 6:02 shortly after. The 25k and 10k were barn burners with many great local runners all pushing hard to break each other in the sandy trails that accompanied the trails. We were really excited as Trail Racing Over Texas to start the fall shorter trail series with a new double header. The Next Generation Trail Races is our first kids only (18 and under) trail run that had a 10k, 5k and 1 mile run. The race had custom bibs, tech shirts and amazing finishers medals as well. We had over 40 run the 1 miler, 25 run the 5k and a few run the 10k race. It was such a joy for us to watch them get a chance to experience a packet pickup, being chip times and getting to see what it was like to run a real trail race. The 5k race was another great mix of older youth that most of which had never run a trail run before and some as small as a 3 year old completed the 5k as well. The 10k race was 4 boys all from the same youth running team so they battled each other around the 2 loop course to the finish line. Overall it was an amazing day to share with the next generation of trail runners. The Night moves race started at 8pm and played host to a 13.1, 10k and a 5k on the beautiful SFA State Park Trails. The 13.1 marathon was highly contested from the beginning with Team TROT runner Jeff Ball, Peter Muessig and Daniel Bucci knocking the top 3 spots. For the female Team TROT runner Tracie Akerhielm taking 1st, Alyson Dunn in 2nd and Sherry Scott in 3rd. The Night moves trail race included glow in the dark shirts, medals and a disco-themed finish line as well. Trail Racing Over Texas brings our first timed event with the Jackalope Jam on October 17th that will start at 7am. The race will be on a 1 mile loop at Carbide Park in Hitchcock Texas. The track is a mix of gravel trail and cement that will loop at the front of the park. We will offer free camping for the saturday evening of the race for those participating. All registered runners will receive a tech shirt at packet pickup, full aid stations with support and amazing medals/buckles. We will have medals for those who eclipse the 26.2/50 mile mark and buckles for those who hit the 100k/100m mark as well. We will be pushing the jackalope theme through the event with shirts, medals and promo items that all detail the mythical creature that is the Jackalope. The days leading up to the race started off well on Monday morning but by 4pm on Monday the weather had changed dramatically. 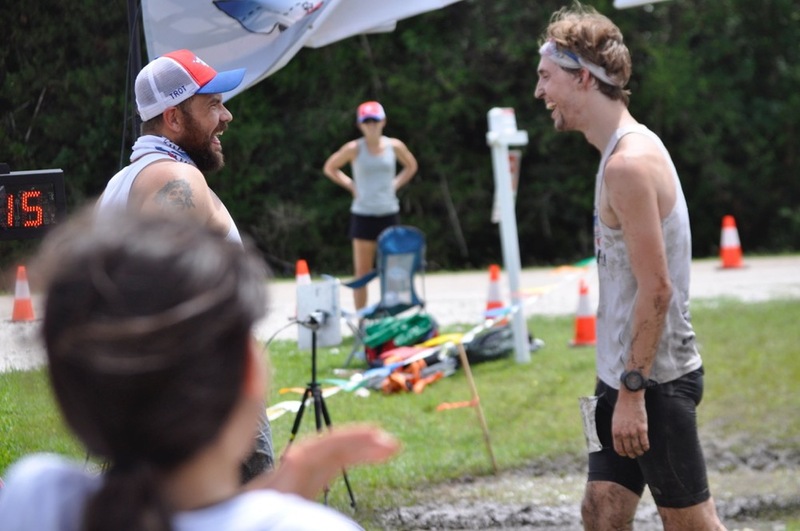 Over the next 24 hour Houston received over 6 inches of water and the Horseshoe Trail Run become one of the hardest courses seemingly overnight. As we marked the course on Thursday we sent an email out to the runners letting them know that the water was ankle deep, bring the flippers and get ready for one heck of a day of trail running. As the day started the 50k runners took off right at 6am out to the course followed by the 25k, 10k and 5kers. Jeff Ball came in to the 1st of his 5 loops and it was apparent that it was going to be a mud field day. Quickly runners started to come in finish the 5k/10k laughing, smiling and covered in the effects of the trail. By 10am many runners had come in and Karbach Brewery showed up with beer in tow. They setup with free beer and all finishers received a pint glass as well for the brew. Rukus Ritas got cranking on the margaritas and Breakfast Burritos Anonymous started grilling as well. The 50k runners came in each loop with multiple layers of mud, water and big smiles. With 68 registered there would only 27 runners that defeated the course. Many of the runners DNF from the 25k and the 50k as the course took its toll on some of the best runners on the course. With over 433 runners this was an amazing day with great runners, sponsors and support from the Galveston Country Parks Department. The Horseshoe Trail Run 50k Top 3 Male and Female Runners are below.